"The Controversial 1909 V.D.B. 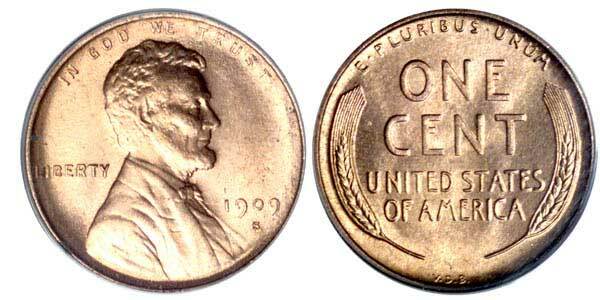 Lincoln Cent" is "Pearl No. 4" from the book Fifty Favorite Numismatic Pearls to be published by Bowers and Merena Galleries and tentatively scheduled for release in the autumn of 2001. In 1905 President Theodore Roosevelt contacted sculptor Augustus Saint-Gaudens, whose studio and residence were in Cornish, New Hampshire, and began discussions which resulted in a commission to redesign the American coinage. Although sketches and even some models were made for several different denominations, only the 1907 Indian $10 and MCMVII (1907) "Victory" $20 gold were ever produced. The artistic, afflicted with cancer, died on August 3, 1907, the rest of his commission unfulfilled. Roosevelt contemplated other options, and in 1908 the commission to redesign the other gold denominations, the $2.50 and $5, went to Bela Lyon Pratt, a Massachusetts sculptor who had been a student of Saint-Gaudens. In the same year, Roosevelt considered the impending centennial, 1809-1909, of Abraham Lincoln's birth, and thought it would be desirable to investigate using his image on coins, the idea encouraged by the proposal of another artist, Victor David Brenner. Unlike Saint-Gaudens and Pratt, Brenner was a dedicated numismatist. He had joined the American Numismatic and Archaeological Society years earlier, on November 19, 1894. In 1902 he was an instructor at the short-lived School for Die Cutting set up in New York by the Society, a venture intended to further artistic concepts in medal dies. In September of the same year The Numismatist listed him as new member 434 in the American Numismatic Association. Around the same time Brenner's other activities included making medallic dies in the private sector, employing the Janvier portrait lathe in the shop of the Deitsch brothers, New York City medalists and badge manufacturers, to reduce his models to die-size.1 In 1903 his Amerigo Vespucci medal, of rectangular plaque format (popular at the time; the annual Assay Commission medals at the Mint were made this way as well), attracted modest attention, and it was reported that 59 were produced. Other designs were made and sold to an ever-widening group of collectors who were reviving the honorable tradition that among his possessions, the gentleman of refinement and distinction might include a cabinet of fine medals. In 1907, Brenner produced a medal and plaque of Lincoln, the last being of rectangular format and made by electrotyping. At least two sizes were produced, probably to the extent of several hundred or more. Over a long period of years I have handled, perhaps, 15 to 20 or so. The image featured a head and shoulders portrait of the martyred president, facing right, with ABRAHAM LINCOLN and 1809-1865 below, and with COPYRIGHT 1907 BY V.D. BRENNER and the artist's monogram in smaller letters along the right edge. From March 7 to 23, 1907, a special display at a literary organization in New York City was described by the Catalogue of Medals and Plaques by Victor D. Brenner, exhibited at the Grolier Club, March 7 to March 23, 1907, for which Brenner wrote the introduction. In 1908 Brenner discussed his Lincoln plaque with President Roosevelt, and the idea was born to use it on coinage, ideally the one-cent piece as it turned out, as the Indian Head design had been in use for a half century and was an ideal candidate to be replaced. Besides, it was easy to view the rich brown surface of the plaque and envision how the same portrait, but sharply reduced, could be employed on the cent. Not much was said about the proposal in public, and numismatists and others were generally unaware of the germinating plan. In fact, for a long time no denomination in particular was mentioned in connection with use of the Lincoln design. In the same year, Victor David Brenner produced the design for a pin-back suspension medal, made by Tiffany & Company, to be worn at the opening ceremony for the opening ceremony of the new American Numismatic Society building on Audubon Terrace, a beautiful setting at 155th Street and Broadway, one of the more upscale sections of Manhattan.2 A number of wealthy patrons including railroad heir Archer Huntington provided most of the financing. The date of the opening, April 6, was picked as the 50th anniversary of the official founding of the Society, which had taken place in the family apartment of teenaged collector and dealer Augustus B. Sage, up a flight of stairs at 121 Essex Street, New York City. Brenner was among the founders and early supporters of the New York Numismatic Club, which was organized on December 11, 1908, at Keen's Old English Chop House, a fine restaurant that served as a popular numismatic gathering spot for years thereafter. Displayed and mounted on the ceiling were hundreds if not thousands of churchwarden pipes belonging to different patrons. The second meeting of the club-usually considered to be the date of founding-in January 1909, saw Victor D. Brenner in the illustrious company of such numismatists as Joseph Mitchelson, Elliot Smith, Albert R. Frey, Frank Higgins, Edgar H. Adams, D. Macon Webster, Thomas L. Elder, William H. Woodin, George H. Blake, Wayte Raymond, and Bauman L. Belden. Later, the club met in other venues. In the meantime, Brenner and Roosevelt continued their discussion for a new "Lincoln coin." Although Washington and Lincoln had appeared on pattern issues of the 1860s, as of 1908 no American president had ever appeared on a coin made for widespread regular circulation, although a commemorative coin dated 1900, the Lafayette dollar, had borne the portrait of George Washington. On the other hand, Lincoln had appeared on certain currency notes during his lifetime. President Roosevelt has given his consent to the placing of the head of Lincoln on one of the popular coins. He conferred today with Director Leach, of the mint, and details are now under advisement. Victor D. Brenner, the New York sculptor, has submitted to the director some models of Lincoln busts, and these have been shown to the president. The head of Lincoln will adorn one side of the coin and the customary coat of arms the other. It is probable that the half dollar piece will be selected as the principal coin to bear the Lincoln head, but some legislation may be necessary to make the change. However, by this time models had been submitted to the Engraving Department at the Philadelphia Mint, and the staff was busy at work on a new coin, not yet identified as being of the cent denomination. Originally a reverse was proposed featuring a design with a single sprig in the center, inspired by the French two-franc piece. Another idea proposed the standing figure of Miss Liberty, also modeled after a French coin. These were rejected, and a reverse depicting two symmetrically-arranged wheat stalks was used, these being stylistic and modern, rather than from nature. The March 1909 issue of the same periodical told of progress, under the title of "Lincoln to Appear on Cent." It was revealed that "several months may pass before the long familiar Indian cent will be displaced by a proposed new issue which will have for its main device the head of Lincoln. The designs for the coins are the product of Victor D. Brenner, and since their acceptance, Mr. Brenner has been kept very busy making the suggested, slight but time-consuming changes." Finally, the dies were cut by Henry Weil, of New York, using Brenner's models. Coinage of the Lincoln cent has been in progress at the Philadelphia Mint for some time. The number of one-cent pieces coined in June, 22,213,575, are believed all to be of the new type. No advance coinage of the Lincoln cent has been made at any of the branch mints. It is not believed that any of the specimens, except a very few for inspection by government officials, have left the custody of the chief coiner. Notwithstanding the advance coinage, the demand for them in Philadelphia was so great that only a limited distribution was made to an individual. Banks were supplied with a portion of their order; at the mint two specimens only to a customer; at the Sub-Treasury 100 was the most anyone could purchase. Newsboys and others, taking advantage of the interest in the new coin, obtained them in hundred lots and found customers at from 2 for 5c to 25c each. All was not well with the new cents. Although this was not heralded in publicity, in honor of the designer the initials V.D.B. were placed at the bottom of the reverse. Soon a controversy arose concerning the initials. Some said that as Brenner had been paid for his design, what he did was strictly as a workman, and no recognition was needed. Others said that the letters were too prominent, and that few knew what the possibly cabalistic notation meant. Complaints were registered, and demands were made that the letters be dropped. All of this defied numismatic tradition, for in 1907 Augustus Saint-Gaudens boldly signed his new $20 piece with his ASG monograph in the obverse field. As far back as the days of ancient Greece, artists had signed their names to dies, sometimes in full, as with KIMON on the silver decadrachm of Syracuse. Within memory, James B. Longacre's initials, J.B.L., appeared on nearly all of the gold coins of the second half of the 19th century, continuing to 1907-8. Fault was also found with the wheat stalks on the reverse of the cent, as they did not represent this species of grain in true life. Other news items included comments that Southerners did not like Lincoln to begin with, and that the use of his portrait on the cent was unfortunate (in contrast, it was said that black citizens eagerly snatched up these souvenirs of the Great Emancipator). About all that was not said is that the Mint was recalling them. Otherwise, it was the most publicized new coin since the 1883 Liberty Head nickel without CENTS. It is mighty hard for me to express my sentiments with regard to the initials on the cent. The name of an artist on the coin is essential for the student of history as it enables him to trace environments and conditions of the time said coin was produced. Much fume has been made about my initials as a means of advertisement; such is not the case. The very talk of the initials has done more good for numismatics than it could do me personally. The cent not alone represents in part my art, but represents a type of art of our period. The conventionalizing of the sheafs of wheat was done by me with much thought, and I feel that with the prescribed wording no better design could be obtained. The cent will wear out two of the last ones in time, due entirely to the hollow surface. The original design had BRENNER on it, that was changed to the initials. Of course, the issue rests with the numismatic bodies, and Europe will watch the outcome with interest. From August 9 through 14, the American Numismatic Association had its annual convention, this year in Montreal. Over 50 members were there in person, and about 450 others were represented by proxies. On Thursday, August 12, the business meeting of the Association was held. Thomas L. Elder, chairman of the Coinage Improvement Committee, reported that he had written to President William Howard Taft, who had been in office since March as Roosevelt's successor, to urge him to change the motifs of the half dollar, quarter, dime, and nickel. "The present designs, it has been the opinion of the leading numismatists, are inartistic and unsuitable." This elicited a reply from a representative of the Treasury, which stated that it was possible to change the design of the five-cent nickel piece, as 25 years had elapsed since its adoption, but that under current rules no change could be made to the half dollar, quarter, and dime until 1917, as these motifs had been adopted in 1892. "At the present time it is not possible to state whether any legislation by Congress may be expected in the near future, relative to changes in the designs of the half and quarter dollar, and the dime." Among other business, it was learned that the new Lincoln cents bearing the initials of Victor D. Brenner on the reverse, V.D.B., would be changed to eliminate the engraver's signature, so a resolution was made calling for the continuation of the original design. While it would have been nice if numismatists could have decided the issue on its merits, the Mint did not listen, and the offending V.D.B. letters were discontinued. By that time President Roosevelt had been succeeded in office by William Howard Taft, who took no real interest in coinage matters. The 1909 V.D.B. cent, of which 27,995,000 were struck, remained plentiful for a long time-sort of a replay of the 1883 without CENTS nickel, but lacking the follow-up advertisements by hobby dealers proclaiming their rarity. Today, they are plentiful in all grades from well worn to red Mint State, the latter usually with some spotting; tens of thousands of Mint State coins exist from hoards. In the 1950s these pieces were so plentiful in circulation that a handful could be obtained in an afternoon's looking through bank-wrapped rolls of cents. On the other hand, the San Francisco Mint version, the 1909-S V.D.B., of which 484,000 were struck, quickly became recognized as scarce, later as rare. These little coppers, with a tiny "S" below the 1909 date, and with the initials V.D.B. on the reverse, fired the imagination of several generations who hoped to find a treasure in their pockets someday. Over the years thousands were plucked from circulation, but never enough to fill the even more thousands of "penny" boards and albums with a yawning "1909-S V.D.B." hole. At the time of issue many Mint State coins were saved, but surprisingly few in roll quantities (I have never handled an original bank-wrapped Mint State roll, a significant statement in my opinion, in view of the rarities I have handled). Probably several tens of thousands of 1909-S V.D.B. cents exist today, including several thousand Mint State coins, the latter mostly MS-60 to 63 with some areas of toning. The late Gobel Ziemer, Owego, New York, antique dealer, related to me that as a young lad living in San Francisco he was on the steps of the San Francisco Mint in August 1909 when the new 1909-S V.D.B. cents were being distributed, and from the first they sold for a premium. (Most Lincoln cents were distributed through the Treasury Department, not from the Mint itself, but apparently a few were given out at the Mint.) Ziemer maintained his numismatic interest for many years, and sometime in the 1960s I purchased his large collection of gold coins. In the "road not taken" department, he also introduced me to a Mr. Faber, who circa 1960 lived near Owego and had a whole barn filled with millions of cigar box labels. He had even written a monograph on them. He wanted to know if I would buy the tons of these he had, but envisioning no market or use for them, I declined. Today, many of these same labels would sell from a dollar or two up to well over $10 to $20 apiece. 1David T. Alexander, "The Circle of Friends of the Medallion: An Appreciation in American Medallic History," American Numismatic Association Centennial Anthology, 1991. In 1983 and 1984 the Brenner's productions were detailed by Glenn B. Smedley in "The Works of Victor David Brenner, a Descriptive Listing," in The Numismatist. 2The American Journal of Numismatics, 1907-1908, pp. 150-152, includes an account of the opening ceremony. 3Apparently, the final decision to use the cent denomination was made in March, per the Report of the Director of the Mint, 1909: "New Design for the One-Cent Piece: With the approval of the Secretary of the Treasury the new design for the bronze one-cent piece was adopted in April 1909. On the obverse of the head of Lincoln appears instead of the Indian head which this piece had borne since 1864. The engraver of the mint at Philadelphia was instructed to prepare dies, and coinage of this piece was commenced in May..."
4Quoted in The Numismatist, September-October 1909.